Why we got fewer fans than ordered? When you place an order with us, you will receive credits in the value of your ordered products. There is the possibility in our members area to change or adapt your campaign at any time. You can for example adjust the quality of your services or change the target group. In many cases, several changes are associated with additional costs. The price for e.g. 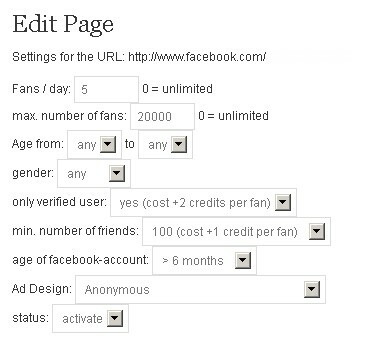 targeted fans (language, country, age and gender selectable) is much more expensive than untargeted fans or verified Facebook users cost 2 credits more per fan. Thus there are higher costs per fan and your advertisment ends when your credits are used up.